My absolute favorite drinks are sodas, with cola in the number one spot. I often wish there were a way to still drink my cola without all of the artificial ingredients. Natural brands in the stores are so expensive and the artificially flavored brands are cheaper. What do you do? Many are turning to making their own soda at home! With the invention of several hot soda making appliances such as the SodaStream, it's become much easier to do so. Buying the syrups for them can get costly too though, so why not make them yourself! Andrea Lynn has authored a new recipe book titled "The Artisan Soda Workshop." With step-by-step instructions and colorful photos, you can create and re-create over 70 yummy recipes to make your own favorite sodas. There are your classics like cola, orange and root beer plus gourmet fruity, herb and spice varieties to try and enjoy. Some of these recipes have as little as 2 ingredients. TWO! It really makes you wonder what all the extra junk in canned sodas are there for. The syrups, once created, can also be used in other preparations besides sodas. Lynn includes other ideas for uses such as a cocktail mixer, ice cream topping, and in a vinaigrette dressing. There's even a recipe included for PB&J milkshakes! Plus an introduction with all you need to know about Soda making and an appendix with seasonal flavors and measurement conversions. The great thing about these recipes is that you don't need to have a SodaStream - regular seltzer water will work just fine, which really makes this budget friendly. The book is a great size for tossing in a purse and heading over to a friends house for a cocktail/mocktail night or any other get together. For every occasion there's a yummy drink to make on this book. I actually think this book provides not only healthier drink options but a budget friendly option for families and parties. I will definitely be using this book often and passing it along to my friends and family. This would make a gift for any occasional, especially as housewarming gift. 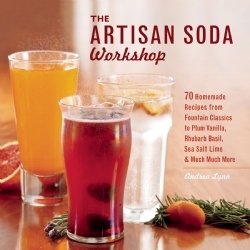 The Artisan Soda Workshop by Andrea Lynn retails for $14.99 and can be purchased at many retailers in-store and online. For more information, see the publishers page here. Disclosure: I was provided a copy of this book without charge by the PR company. All opinions contained in this review belong solely to me and were not subject to editing.